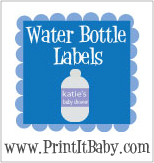 Free printable party favors are a hot commodity on the internet. We've spent a great deal of time researching the different sites that make these available to you. Here is a standard example of what's out there found at packagetech.com. We like this site. The favors this creator offers are in PDF format so they print out large enough to use. They are cute and customizable as well. 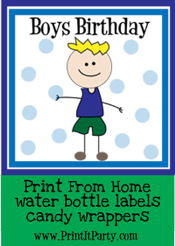 If you are looking for an online resource with a few free printable party favors, this might be a good fit. There are also a handful of links to the right for sites whose printable favors we have tried and liked. 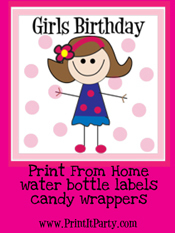 There are other printable resources you can use to create party favors. For example, let's say your five-year old son is having a pirate-themed birthday party and you don't like the favors available for purchase. Grab a couple of party favor bags in a bright color (red, green, or even black) and get out your glue! Find a cool graphic either online or in a graphic editor program (see example at right). Print the number you need, cut them out, and affix them to your favor bags. Personalize it a little more with each child's name using either a marker, stickers, or by typing up each name in a text editor and printing them out as well. Essentially, you could create the whole favor bag by printing! Want a few printable party favors for adults? Perhaps you're having a New Years Eve Party. You've grabbed a bunch of sparkly silver favor boxes from Michaels. For some reason simply adding your guest's names does not produce the effect you desire. Find a simple graphic like the one on the left. Print them, glue them on (or use a tape-runner if you're a scrapbooker! 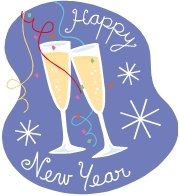 ), add a ribbon, and you've got a party favor with flair! Now all you need are some mini champagne-shaped chocolates to fill each bag and your guests will be ecstatic! Back to Party Favor Ideas. Return from Printable Party Favors to Home. Click on any photo for more info!